Every year I rack my brain for a unique Father’s Day gift to give my husband . It usually ends in something last minute and not very thoughtful. I came up with the ‘gift a card’ idea because my husband always has the kids on the weekends in the summer (while I’m busy catering) and is looking for things to do. The card has a pocket for 6 gift cards, for places and things they can do together. Creating the pocket card was super easy! I used May Arts ribbons, Core’dinations 6×6 vintage paper, and Stampendous chunky glass glitter. 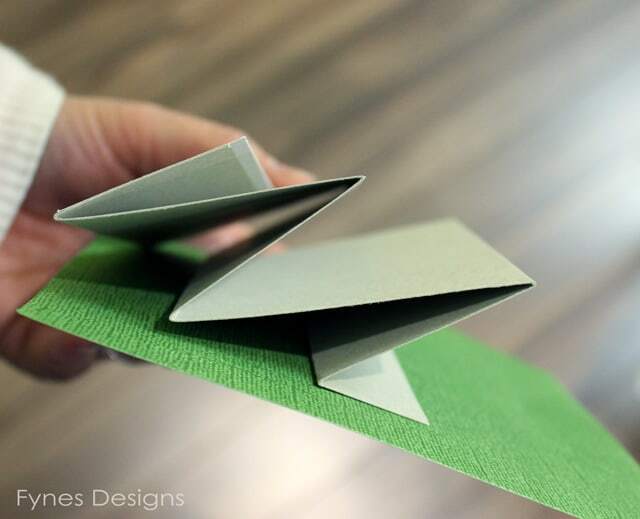 To create the card holder cut a strip of paper 4 1/2″ wide and 12″ long. Scor lines at 1-1/2″, 4″, 6″, 9″, and 11″. Accordion fold the strip. Adhere to the cardstock on the shortest fold, and sew edges to complete the pocket. Embellish as desired with Authentique Strong collection, ribbons, and glitter. 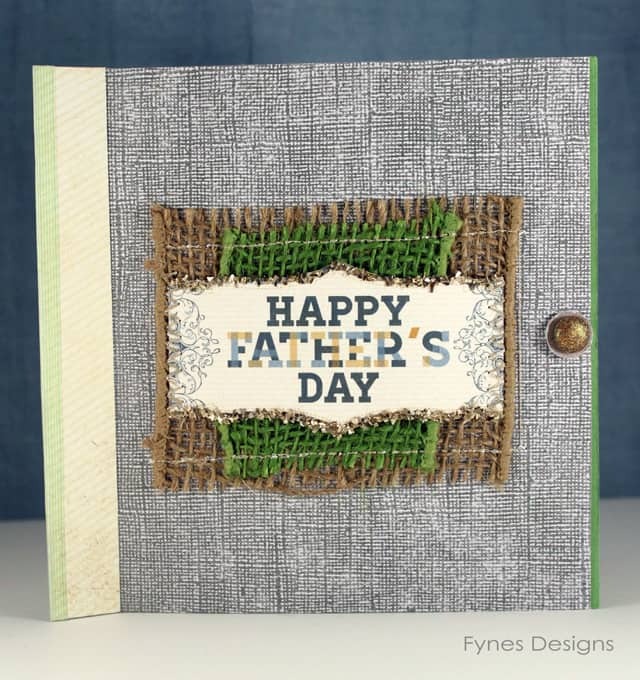 Check out another great Father’s Day Craft here. I hope your Dad is a happy dude this Father’s Day! Great card. ! The gift card idea is awesome . TFS . What a fantastic idea! There are so many uses for a card like this. Thanks for sharing and being your creative self, Virginia! Great designs. I also have a video on how to make great greeting cards on my site. What a great idea for your husband. I like the texture of the burlap. Love your father’s day card Virginia! What a smart idea! Love it, thanks for sharing! Love this card! An awesome idea for the hard to buy for Dad. I love your pocket card. So neat the way you used the burlap to decorate the outside. Great dimension. I love this! What a great idea for any dad, grad, mom, or kiddo! Lots of possibilities for sure! You make it look so simple, I might just have to give it a whirl myself! Thanks! What a great masculine card! I love how you colored the “FATHER’S”! Great effect! I also love the pocket card design and the closure! TFS! Love the Father’s day card. The burlap is a nice touch. So cool, great idea! LOVE it! What a cooooool idea. I love all of the textures. 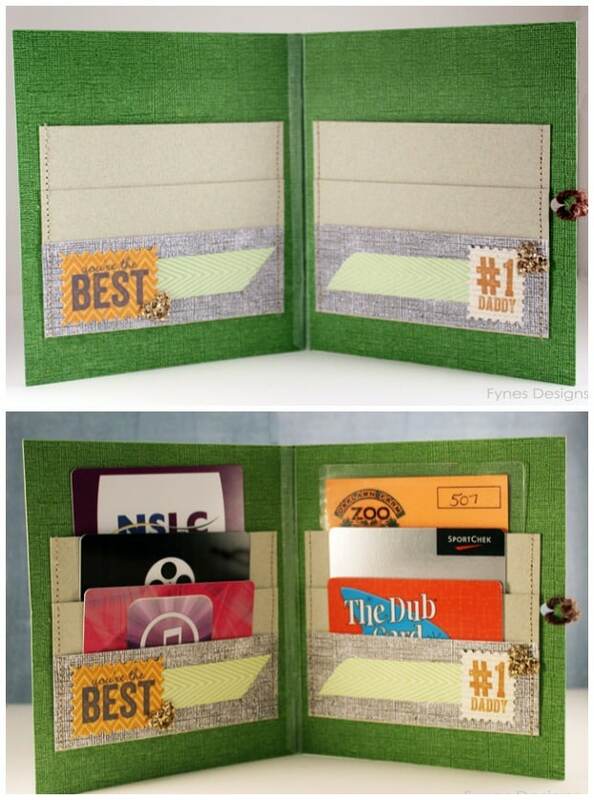 Love your beautiful card and the pockets are just delightful – what a terrific idea! Masculine designs always hem me up, but wow! Love the elegance and simplicity of your design off to make this for my daddy for Father’s day. Lovely work, thanks for the chance to win! What a super fun idea for a Dad card! Thanks for sharing your creativity with us all. Great Father’s Day card! Love all those pockets too! This is a great idea. You know what the kids like to do and what things your husband will agree to do with them. Providing them with the ideas and the admission makes “what are we going to do now” much easier to answer. How fun is this! And it does a great job of highlighting some awesome products. This is a really fun project! Thanks so much for sharing your talent with us on this Blog Hop! What a wonderful idea! Thank you or the detail instructions! Awesome card, I love the colors. Thanks for the tutorial. Liked it so much, I pinned it so I could make it later! What a great gift card holder! Not your standard fare and I just love it! I love this card. The pockets are great and it has a real masculine feel to it. Super fun and super practical idea.Thanks. Wow! What a super idea and I love the masculine look, something not that easy to create! Very clever! what a great little gift card holder! Love the texture from the burlap on front. This is such a great idea! I’m going to try out the gift card idea! Too fun! Thanks!